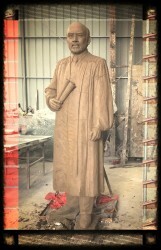 The 10-year anniversary committee of the Justice A.A. Birch Building will dedicate a statue of Chief Justice A. 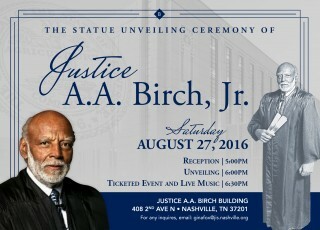 A. Birch, Jr. a state Supreme Court judge, who served 37 years as a judicial stalwart, at 5 p.m. on Saturday, August 27, 2016 at 408 2nd Ave N, Nashville, 37201. A celebration, held in his honor, will include a program at 6:00 p.m. with a statue unveiling, ribbon cutting and award celebration. Immediately following the program, a reception, with live music, will continue to celebrate Justice Birch who historically served at every level of the court system within the State of Tennessee. Justice Birch’s legacy will be honored with an 8-foot foot, life-size bronze statue with a 4-foot granite base to include an historical marker as part of the rededication of the Justice A. A. Birch Building. Designed by nationally renowned sculptor Brian Hanlon, the statue will be unveiled in the plaza area in front of the Justice A. A. Birch Building. Justice Birch is the only person in Tennessee history to serve at every level of the state's judiciary. In 1969, Governor Buford Ellington appointed him as a General Sessions Court Judge in Davidson County, making him the first African American to serve in that office. In 1978 he was appointed Criminal Court Judge for the Twentieth District (Davidson County) by Governor Ray Blanton. Again, he was the first black ever to serve in this capacity. On March 2, 1987, Justice Birch was appointed to the Tennessee Court of Appeals by Governor of Tennessee, Ned McWherter. In August 1990, Justice Birch was elevated by the voters under the provisions of the Tennessee Plan to the Tennessee Supreme Court, becoming only the second African American ever to serve on that body. In 2006, Justice Birch announced his retirement from the bench and the Justice A. A. Birch Building was dedicated in his honor. Justice Birch passed away in 2011 and has been greatly missed, but his contribution and significance to our justice system continue. For more information visit the courts website or contact, Judge Rachel L. Bell at rachelbell@jis.nashville.org or call 615-862-8341; Gina Fox, with General Sessions Court Administration, ginafox@jis.nashville.org or call 615-862-8317.